One of the most iconic sites in Chengdu has to do with some of its most cuddly residents: China’s Giant Pandas. With a population of less than 1,000 in the wild (and only found in the Sichuan, Shaanxi and Gansu provinces of China), these pandas are protected by China’s laws to help maintain and grow the panda population. The Chengdu Research Base of Giant Panda Breeding was established in 1987 to further rescue, protect, and assist in the breeding of these cherished creatures. The Base’s geographic location and excellent technological and professional resources allow it to carry out off-site conservation efforts and to improve the artificial reproduction procedures to increase the giant panda population. 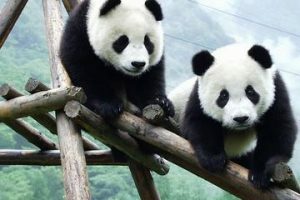 Visitors to the Base, which is just 6 miles from downtown Chengdu, can see the pandas – as well as other animals including lesser pandas, swans, birds, and butterflies – in 92 acres of simulated natural habitats. Based on availability and at an extra donation, guests can also book the opportunity to hold a baby panda. Known as one of the places where Taoism was founded, Mount Qingcheng is a historic, cultural, and natural wonder. From Chengdu, catch a bus or high-speed train to this mountain range above the Chengdu Plain. The air is very clear at Mount Qingcheng, thanks to the high altitude, trees and lake, and the multitude of temples dotting the mountainside make for fascinating exploration. Visitors can choose to climb the anterior or posterior portions of the mountain, or take a cable car on the anterior portion. The anterior part is where the Jianfu Palace, Shangqing Palace and Tianshi Cave are found, as well as the Laojun Pavilion at the highest peak. The posterior part has a few temples, but is largely a pristine site for hiking and taking in the stunning views of the surrounding mountain peaks, forests and streams. Chengdu locals are said to live a relatively laid-back lifestyle, with relaxation, entertainment, and cuisine an important part of the city. Chengdu’s tea houses have stood for centuries and provide visitors a chance to appreciate age-old rituals, enjoy delicious fragrant tea, and take in local culture. Worthwhile tea houses can be found throughout the city, such as on Huaxingzheng Street, which provides free Sichuan opera performances every Tuesday and Saturday at 2pm; in Renmin Park, where it is picturesque and quiet; on Jinli Street, among other restaurants, bars and craft shops; or in the Wenshu Monastery. The nightlife in Chengdu is found primarily on select busy streets such as Renmin South Road and west of Yangshi Street. The offerings vary from club to karaoke bar to bowling alley. The food in Chengdu features the complex and pungent flavors known in Sichuan cuisine. The famous “Chinese hot pot” can be found here, as well as other typical dishes such as Ma Po Tofu (a spicy dish of tofu, ground beef or pork and chili peppers) and Kung Pao Chicken. While hot pot was introduced in nearby Chongqing, Chengdu’s hot pot has its own style and spice combinations. One of the more famous hot pot restaurants in Chengdu is Huangchen Laoma, a traditional hot pot restaurant that also offers opera and shadow puppet performances for dinners. A must-see while in Chengdu is the historic Kuanzhai Street, where tea houses, restaurants, shops, and artists can be found among restored architecture. At Damiao Restaurant on Kuanzhai Street, the offering is not only delicious hot pot, but also Sichuan opera. Sichuan opera originated during the Qing Dynasty (1644-1911) and features theatrical makeup, colorful costumes, and a variety of performances, including the famous “face-changing” or flame spitting. While the Sichuan opera performances at Damaio give visitors a small taste, Sichuan opera can be seen throughout Chengdu at places from the Sichuan Opera Arts Center to People’s Park. Initially built in the Tang Dynasty (618-907), Wenshu Monastery was once called Xinxiang Temple. Today, Wenshu Monastery is the best-preserved Buddhist temple in Chengdu. Hundreds of cultural relics are housed there, including paintings, calligraphy, and other precious works of art by renowned Chinese artists from throughout the centuries. Other religious and historic artifacts can be seen at the Wenshu Monastery, from a delicate jade Buddha statue brought from Burma to China in 1922 by Xing Lin, a Buddhist monk who walked the whole distance to the skull of a renowned monk from the Tang Dynasty. Lovely gardens, musical performances, and a tea house can also be found within the monastery, making it an excellent place to explore while in Chengdu.